Files with the .EML extension are individual email message formatted to be compliant with the RFC-822 specification. EML files contain the email messages, file attachments, html code, and even internet header information. As an open standard, EML files are accessible to virtually every email client. Because its an open non-proprietary standard (unlike the .MSG format which is Microsoft's proprietary equivalent) EML files are often used to archive email messages. Archiving Microsoft Outlook email as .eml files is not possible without specialized software. MessageExport is an add-in that adds EML export to the Outlook toolbar. Being tightly integrated with Outlook makes it quite simple to use. Below is a video that explains the process. Basically all that is required is to select the email message within Outlook. A message is selected when it is highlighted. MessageExport lets you select individual files, a range of files, or you can select and export an Outlook email folder and sub-folders. The next step is to choose "Export to EML" from MessageExport's drop down list. Lastly, click the blue Export button. 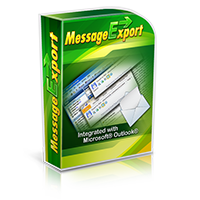 MessageExport is capable of extracting one, hundreds or even thousands of email messages from Outlook. In addition to .eml format, you also choose .pdf, .msg, .gif, .tif, .csv, .mbox, and other file formats. MessageExport is a very useful tool for extracting Outlook email messages to .eml and other formats. If your work requires that you file or format email messages, then you'll find MessageExport to be a huge time saver. Download a free 15 day trial of MessageExport.